Organized Home Schooler - Home Organize It! Want to be an Organized Home Schooler? Here's where you will find out about how to get more organized as a home schooling mom/dad/family. You will find the best resources for keeping home school materials organized as well. "Erin, I've always been organized but since I started home schooling..."
"I have systems in place but they just aren't working"
"Our home school materials are organized but somehow the rest of the house is a disaster!" If any of these sentiments sound familiar to you, you've come to the right place. Since you already know the benefits of home schooling, I won't address them here. But home schooling does bring a whole new dimension to your home. For starters, you and your children are home more! And if you're home more, then every inch of your home is being used 24/7. bathroom use - can't be avoided! The use of every room in your home is dramatically increased over that of families with public/privately schooled children and parents who work full-time and/or part-time. It's not surprising then that with this increased use comes a greater need for becoming an Organized Home Schooler. Now I'm not a home school mom, but as a Professional Organizer I've worked with moms who ARE homeschooling. At first I started to help these moms gain better control of the rest of their homes, hoping that by the time we got to the actual organizing of home schooling area/supplies that it would be a breeze. This presented a challenge for me so I set out to find resources to help these moms organize their "home schools." 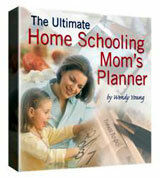 Wendy Young of South Africa is a homeschooling mom of four who developed The Ultimate Homeschooling Moms Planner. School planning – from preschool to high school and, you guessed it... much more! Another helpful resource that I found at my church library is called The Organized Homeschooler by Vicki Caruana. The title jumped out at me I suppose because I had these home schooling moms on my mind a lot lately. It's been a very helpful guide for me when trying to help home schooling clients. "The Organized Home Schooler" is based on Biblical teachings. The premise of Vicki's book is that organization is a matter of the heart. She gives practical guidelines for becoming a more organized home schooler. If you've checked around elsewhere on this site, then you already know that I'm a huge promoter of realistic organizing and teaching your children how to keep things organized. Vicki's homeschooling advice is realistic, practical and doable. She is very clear that different organizing approaches work for different family personalities which I believe is true. And she stresses that you need to "look into your heart to find where to start. Vicki describes how to set up a home school filing system and she offers additional resources including helpful Web sites at the end of the book. She really does want you to desire to get organized "from the heart" and there are many references to Scripture. Vicki, she does not offer any hurry-up-and-do-this solutions. If you are in a hurry to get a "system" in place, this book may not be for you. But if you are ready to start your journey toward a more organized and peaceful home schooling home, I highly recommend it. Are you a homeschooler who'd like to earn additional income from home? Many of my organizing clients who homeschool have expressed a desire to be able to contribute to their family finances. By deciding to homeschool, most of these families are living on one income. In today's economy it's becoming increasingly difficult to support a family without the help of both parents. Since I make more of my income online than offline, I started suggesting to these moms that they consider starting a part time internet-based business which they can do from home around their homeschooling schedules. Sometimes I'd hear things like "but I don't know much about that sort of thing" or "me? build a business?".... things like that. I just tell them that if I (who was computer-phobic just a few short years ago) could learn how to earn extra income online, anyone can. I think back to when my children were younger and wish that I had the opportunity the Internet brings to moms (and dads) who need to add to the family income. There are so many opportunities and yes there are also a lot of scams. However, if you have a strong desire to make this happen, you can. I invite you to read about my organizer journey which tells you more about how I have added additional income streams to my organizing business... a real blessing to my family. While you are reading, think about your own passions and hobbies and try to envision yourself doing something similar. Many homeschooling families (including Wendy from South Africa who created the Ultimate Guide I talked about above) are building online businesses. Some are even incorporating them into their home school curriculum and teaching their children valuable entrepreneurial skills in the process! Tugs at your heart, doesn't it? Have a Homeschooling Organizing Tip? As a Professional Organizer, I've worked with many moms who are homeschooling. I've witnessed first hand the transformation in their lives through getting more organized. Do you have a homeschooling organizing tip that has enriched your family's homeschooling experience? Here's your chance to tell others about it! It's as easy as posting to your favorite social network! Your entry will appear on a Web page just the way you enter it here. You can wrap a word in square brackets to make it appear bold. For example [my story] would show as my story on the Web page containing your entry.